*Schoolies Bookings Not Permitted - No School Leaver’s Booking allowed during the Schoolies Event. Our property does not participate in the Schoolies Event, thank you. 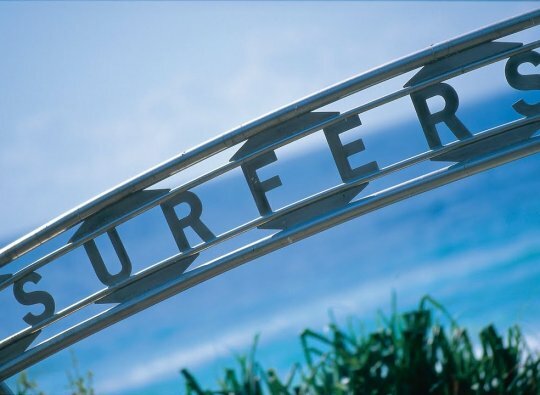 Located on the esplanade Surfers Paradise, Hi Surf Apartments is a true beach lover’s haven, not to mention the “lifesaver” patrolled swimming area, with the famous red and yellow flags, is directly out the front of the resort. Get into the lazy holiday spirit with long afternoons spent lounging in the sand with a good book, enjoy a dip in the ocean, let the kids giggle & climb in our onsite playground or treat yourself to a local surf lesson! 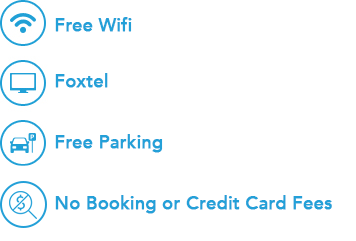 Our spacious, bright and comfortable one bedroom apartments come with fully equipped kitchens with dishwashers, full laundry facilities, free WiFi, a comfortable lounge area with TV (includes Foxtel) and separate dining area. Take in the fresh ocean breeze from your apartment’s own private balcony with views over the beach. There are ceiling fans in bedrooms and most apartments feature air conditioning. Apartments are serviced weekly with a full linen change. Additional apartment servicing or replacement towels are available on request at an extra charge. The one bedroom apartments at our beachfront Accommodation Gold Coast feature one Queen Bed and are suitable for a maximum of three guests. 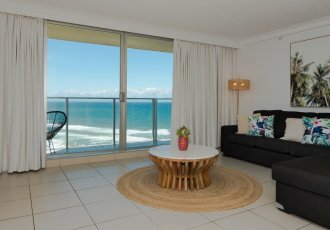 These Surfers Paradise apartments come with magnificent, uninterrupted, panoramic ocean and beach views. Each apartment has a fully equipped kitchen with dishwasher, private laundry facilities with washing and drying machines, Large TV with Foxtel, free WiFi, ironing facilities and separate living and dining areas. Escape to your own private balcony to unwind with a good book. These apartments feature one Queen Bed and two singles and are suitable for a maximum of five guests. 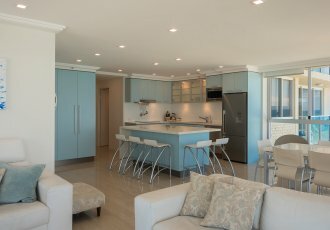 Featuring stunning uninterrupted ocean views, our spacious 3 bedroom apartments feature fully equipped kitchens with dishwashers and induction cook tops, private laundry facilities, a Loewe television with Foxtel, free WiFi access, separate living and dining areas and a large balcony overlooking our world class beach. Apartments are serviced weekly with a full linen change. Additional apartment servicing or replacement towels are available on request at an extra charge. The three bedroom apartments at our Gold Coast paradise resort feature one queen bed, two king singles, one set of low-set bunks (suitable for two children up to 12 years of age), and are suitable for a maximum of six guests. "I have stayed with Hi surf on multiple occasions, on every single time have been treated to an amazing apartment, with nice facilities and great staff. Highly recommended :) The apartments have an amazing view over the water along surfers paradise. Could not think of a better apartment to stay at." "My husband, and I and a real good friend stayed for a week, and found it was the best week ever. Our apartment at the Hi Surf had great views of the beach and the v8 track, which at the time of our stay was under construction, but will be a magnificent view and place to be when the v8's start, what a shame we came two weeks to early. Our unit was c"
"I so enjoyed my stay there, a great apartment with fantastic views and so close to a quiet beach and yet only a ten minute walk to town. What made it even more special was the management who are down to earth just really nice people!" 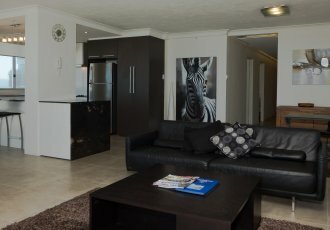 "I have just spent the last 5 days at Hi Surf Apartments, I can't say enough about the apartment! The view was amazing from every room. It has every thing you need and the New Years fire works just added to my fantastic trip to Hi Surf Apartments. All the staff were friendly and Judith did everything to make my stay wonderful so thank you for everyt"